#ConversationWith Nanjira Sambuli: Unwrapping Brilliance. Nanjira Sambuli is an emerging voice of Kenya’s digital space. At 24 she is definitely punching above her age but as the Igbo say, if a child washes his hands he could eat with the kings. The World Bank, United Nations Environment Programme are some of the international bodies that seek her services. 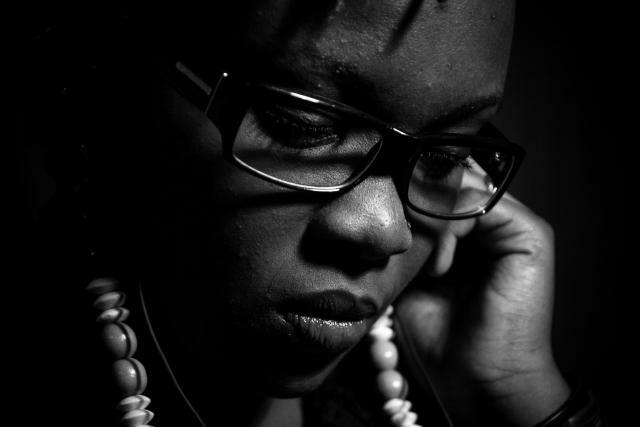 She is consistently at the center of unfolding conversations in Kenya’s and international cyberspace. 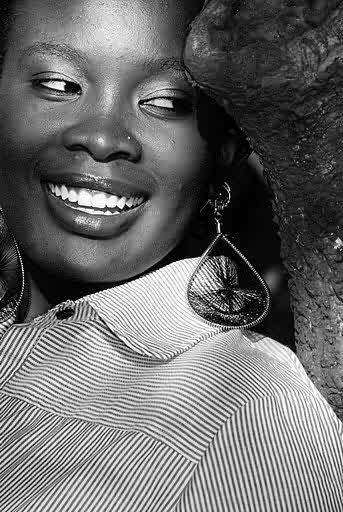 She is @NiNanjira on twitter and her bio reads – New Media Evangelist. Musician. Futurist. Polymath. Pan-Africanist. Representing Africa one tweet at a time! Africa isn’t poor, just mismanaged. 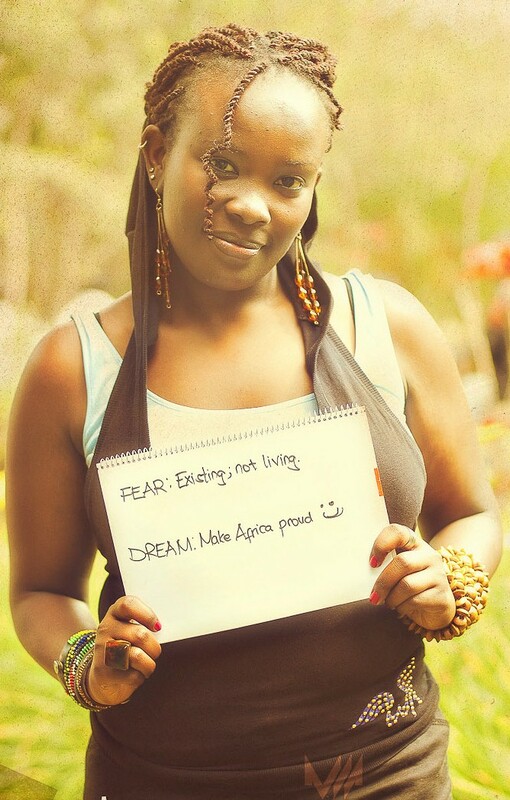 Recently she was a panelist in a talk dubbed ‘Perspectives of the Digitization of Art and Life in Kenya’. The panel consisted largely of folk with Prof.’s and Dr.’s in their titles and she was able to comfortably hold her own. In the midst of her busy schedule she graciously made time to chat with Moderate Kenyan on matters professional and personal. Nanjira: Introvert. Melancholic. Open-book. Spontaneous. Nanjira: Competitors would say overly passionate. My friends would say I am funny and goofy. Nanjira: It goes through phases. Currently it is seeing Kenya go through this crazy phase and jump into a progressive path. Kenya has never gone through civil war. I hope that we do not have to go through it to realize what we have. I also want to break barriers that exist globally for the youth and foster collaborative exchange of ideas. Nanjira: (pauses) Me! It is I who is the master of my fate with God as my guide. I know I am gifted, a polymath, I have to make my gifts count before I die. Nanjira: My closest pals right now. My immediate circle of friends number six or seven. They have refused to let me be less than what I can be. They call me out and keep me accountable always. Nanjira: (pauses and ponders for a while) Eish, this is a hard question. I am honestly drawing a blank. I guess my happy moments are too many for me to pick one. Nanjira: My childhood. We moved around a lot and thus I was not rooted. I became a loner and do not have any childhood friends. It is a plus now as I learnt how to detach and also can easily be a global citizen. Nanjira: I have learnt that as fire is the test of gold, adversity is the test of strong men. Nanjira: I am passionate about communication and realize the limitless opportunity that the digital space provides. Think of me like a preacher who tells people the importance of having an online presence. I am the Generation Y poster child! Nanjira: (laughs) No! I have been called that but people close to me know how I hate that word. I reckon activism is a call to action. I am not yet at a position to do that so I stay away from it. I am into advocacy and awareness as I reckon that for enlightenment people need facts. Nanjira: No! I would not endorse anything I do not believe in. Money is fleeting. Reputation and ideals are more tangible. Nanjira: No! I would not endorse a candidate for money. Politics can really burn someone. I would agree to be hired to explain the ecosystem but never to pigia debe a candidate. Nanjira: I am informed by the connections I have made online. I have encountered an African Diaspora driven by a wish to make Africa better. It is a re-birth of the Pan-Africanism that was big immediately after independence. I reckon we are carrying on the spirit of our fore-fathers. Nanjira: It is more than just a quote. It is a mindset. It is something that I have strong convictions about. It is my mantra. I am living it in the tasks and projects that I undertake. Nanjira: I am part of a project that is engaging researchers, lecturers and such like policy folk and showing them how to tap into the digital conversation. The project seeks to bring the intellectuals on border as regards digital sphere and demystify new media to them. Moderate: You are an actuarial science graduate, a dread-locked musician and a consummate creative. Contradiction or not. Nanjira: Actually not. A look at history tells you that the greatest creatives were the folk who knew a lot. Da Vinci springs to mind. And Math which is just sequential logic is art! Nanjira: I interned in a bank and also in an insurance firm. Yes, shockingly. Even wore suits to works. (laughs). In my current undertakings as a digital evangelist I do work with numbers a lot. For example I am part of a World Bank open data project that seeks to undertake an in-depth analysis of foreign aid given to countries, its intended use and its actual use. So yes, I am using math artistically. Nanjira: To thy own self be true. Moderate: Thank you for your time. The Igbo also say you can tell a ripe corn by its look. Nanjira Sambuli is definitely someone to watch and Moderate Kenyan is watching. A wise man once said that when you do what you love than you will never have to work a day in your life. Every day will be a continuation of the love-affair with your passion. Very few people are lucky enough to experience this. 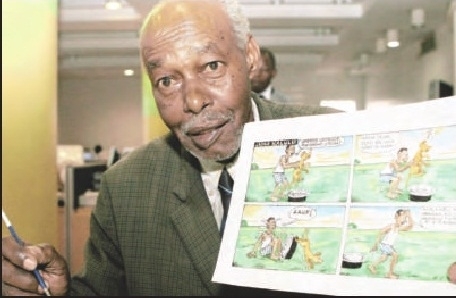 Edward Gicheri Gitau who is the man behind the long-running comic strip on Taifa Leo – Juha Kalulu – is among the lucky few. I was privileged to meet him and as a creative I was totally inspired and challenged by what he shared. Mr. Gitau who is 82 years has sketched Juha Kalulu for a whooping 62 years and he is still going strong. He began at inception of the Nation Media Group’s Kiswahili publication in 1960 when Taifa was a weekly which soon became a daily – Taifa Leo – and he had to quickly adopt. The name Juha Kalulu which has come to be synonymous with Mr. Gitau has an interesting origin. Mr. Gitau worked as an electrician in what was then known as Tanganyika in 1948-50. While there he struck up a friendship with Malawians and from them he picked up that in one of their dialects Kalulu is a hare. From his Kiswahili, he knew that a Juha is a person who is mostly clueless or ignorant. In most societies, hares are known to be cunning – ‘Sungura Mjanja’ – but Mr. Gitau twisted that and Juha Kalulu is in his words “Sungura Mjinga” loosely translating to an idiotic hare. Therefore Juha Kalulu is a creative wordplay. An accident while at work ended his career as an electrician and his sojourn in Tanganyika. Upon his return to Kenya he started employing his creative mind to cartooning and his childhood love for drawing found on outlet. He worked briefly for a several publications in the 1950s – notably Tazama – before joining Taifa. Mr. Gitau who was taught English and Geography by Mzee Jomo Kenyatta at Githunguri High School has through Juha Kalaulu rubbed shoulders with the high and mighty. His proudest moment was when President Kibaki wrote the foreword to his book ‘Vituko vya Juha Kalulu‘. While his age-mates have long retired, the veteran cartoonist is still cartooning with a work ethic that is completely amazing. He manually sketches every illustration and then personally hand-delivers his artwork. Despite his advanced age his zeal and articulation to his craft are still solid and intact. His fluency in English and Kiswahili is impressive. His dress style – suit and tie – is that of an English don. His humor and sharp mind are thoroughly engaging. He has no desire to retire but then if you really think about it since he started cartooning he has never really worked a day in his life but rather he has enjoyed living his passion. I am thrilled to celebrate Edward Gicheri Gitau a.k.a Juha Kalulu who is a LIVING LEGEND! Today is the 22nd anniversary of Saba Saba Day. The first Saba Saba day was marked on 7. 7. 1990 under a hail of tear gas and a violent confrontation between Kenyans tired of the oppressive KANU regime and riot police who were agents of those seeking to protect the regime. 22 years ago Kenya had a dictatorial president who was for all intents and purposes a god, a mutilated constitution, an oppressed media with only one TV and one radio station that were mouthpieces of the regime, it was a one-party state, the intelligence services eavesdropped on all conversations and a wrong word could land you in the torture chambers, one could not freely trade in forex, the judiciary sang to the tune of the president and so on and so on. Yes, I know for most reading this, they cannot comprehend that kind of life but these and more bad things was the usual life for Kenyans. Until a group of men and women said enough is enough. They gave up lives, limbs, minds, families, jobs, comfort to fight the oppression. They did not have twitter, facebook or mobile phones but they had a dream of a better day for Kenya and Kenyans. 22 years later, Kenya has a new constitution, a presidency with term-limits, a free and vibrant media, freedom of expression with guys able to even question the president with no fatal repercussions, there are 51 registered political parties, dollar accounts are common place for many, there are ongoing reforms in the judiciary and so on and so. Kenya has come from FAR. Blood, sweat and tears were shed by very brave men and women to gift us this free and democratic space we by and large take for granted. In an ideal situation, Saba Saba Day would be a national holiday: a mega celebration of Kenyan heroes and heroines – an acknowledgement of the strides taken by Kenya in the last two decades. However, as is the case in many revolutions, those were get the spoils are those who sacrificed the least. Thus Kenya is still by and large controlled by people who were part of or directly or indirectly supported the oppressive KANU regime. A flamboyant celebration of Saba Saba Day would therefore also be an indictment of their complacence during Kenyans dark hour of need and of the fact that they are enjoying democracy and freedoms they fought against. A tree with no roots withers and dies and so does a country with no history. I choose to remember Saba Saba Day. I choose to celebrate Saba Saba Day. I choose to give thanks this Saba Saba Day. I remember all the 2nd liberation heroes and heroines who gave up lives, limbs, minds, families, jobs, comfort to fight for Kenya’s current democratic/free space. I celebrate all the 2nd liberation heroes and heroines who gave up lives, limbs, minds, families, jobs, comfort to fight for Kenya’s current democratic/free space. I say thank you to all the 2nd liberation heroes and heroines who gave up lives, limbs, minds, families, jobs, comfort to fight for Kenya’s current democratic/free space.